Right in the middle of the estate are two large forestry blocks, originally planted by the Forestry Commission in the 1950s. They have all the characteristics of the planting of that era; regimented blocks of trees with Scots Pine interspersed with non-native species like lodgepole pine and sitka spruce. They are not pretty to look at and make a poor contrast with the new ‘native caledonian’ planting of the early 1990s. We have been scratching our heads for some time about what to do with the forestry, burdened by low timber prices which would not even cover the cost of felling and removal. That changed in the last two years though and we started last year with a multi-year thinning programme. 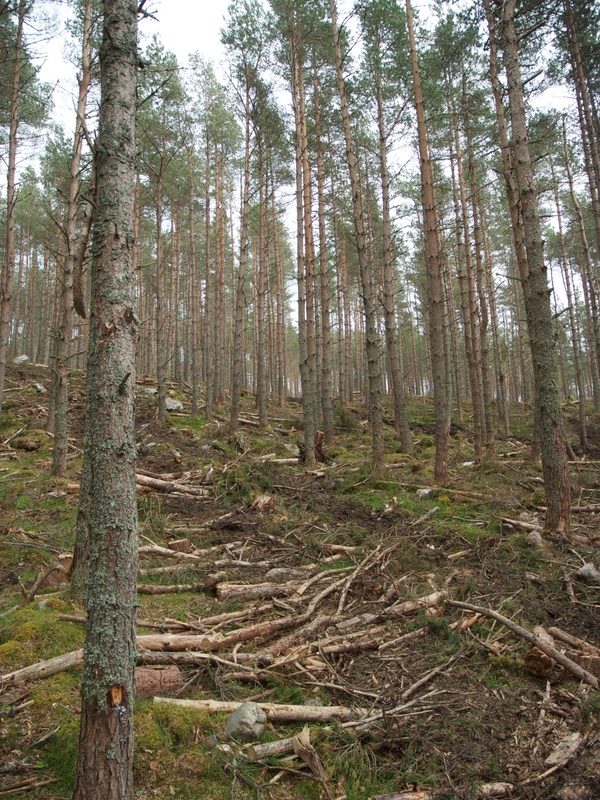 This programme is removing most of the non-native trees and thinning the Scots Pine so that we let more light in, develop the forest floor and let the remaining trees develop naturally for many more years. We are seeking to convert a commercial plantation into something more like a natural pine forest. Out first year was a definite step forward but we were not quite satisfied with the overall effect. But, with the help of Scottish Woodlands, I think we are getting into our stride and developing an approach which is avoiding too much mess and really opening up the forest. You can see 200 yards through the trees, not 20. There is a lot more to do but we are very pleased with the way it is going. This entry was posted in Uncategorized and tagged Croick, Croick Estate, forestry. Bookmark the permalink.